Abstract: This article outlines how sounds are produced and how speech and language develop, in the child. The assessment of speech by a speech and language therapist is briefly described. 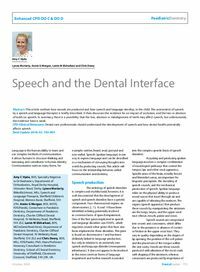 It then discusses the evidence for an impact of occlusion, and the loss or absence of teeth on speech. In summary, there is a possibility that the loss, absence or malalignment of teeth may affect speech, but unfortunately the evidence base is weak. Clinical relevance: Dental care professionals should understand the development of speech and how dental health potentially affects speech. Author notes: Amy C Hyde, BDS, Specialty Registrar in Orthodontics, Department of Orthodontics, Royal Derby Hospital, Uttoxeter Road, Derby, Lynne Moriarty, BMedSci(Hons), MSc, Speech and Language Therapist, Sheffield Children’s Hospital, Western Bank, Sheffield, S10 2TH, Annie G Morgan, BDS, MFDS, FDS(Paeds), Consultant in Paediatric Dentistry, Department of Paediatric Dentistry, Charles Clifford Dental Hospital, 76 Wellesley Road, Sheffield, S10 2SZ, Lamis M Elsharkasi, BDS, MClinDent(Paed Dent), Department of Paediatric Dentistry, Charles Clifford Dental Hospital, 76 Wellesley Road, Sheffield, S10 2SZ and Chris Deery, BDS, MSc, FDS(Paeds), PhD, Dean/Professor/Honorary Consultant in Paediatric Dentistry, School of Clinical Dentistry, University of Sheffield, Claremont Crescent, Sheffield, S10 2TA, UK. Objective: To understand the development of speech and how dental health potentially affects speech.